Hello everyone. My name is Basim Abdullah and I am a Finance and Accounting Masters student at the Surrey Business School. I have been in contact with a lot of you directly but would like to stay connected through my blogs as well. I’m a very happy going Pakistani student here not just to study but make more friends, explore and experience this side of the world. A bit about me, I was born, raised and did most of my studying in the desert (Saudi Arabia!). I never really lived in my parents’ home country, Pakistan where we would only visit during summer vacations which was always exciting for me, a lot of new people to meet and fun things to do but at the same time it can be quite surprising too, as they say expect the unexpected in Pakistan. I found myself closer to the Saudi culture and traditions- and I have to mention the food too – have to mention the shawarma here! Living in Riyadh, the capital was great. All about fast cars, tall – very tall buildings, lots of food and a lot of heat. There came a time when I wanted to experience life outside of Saudi, Pakistan seemed like a good option and I decided to move there to start my accounting life. Living there for 3 years was a learning curve, an experience I will never forget. I lived in Karachi, enjoyed getting used to planning for the unexpected! I worked a little bit in the tourism industry gaining practical experience in accounting but I was also waiting to graduate from Oxford Brooke’s after which another exciting journey was to begin – start my masters! The process of selecting the right school which fits well with my future plans but is also fun to spend a year or so in, was not easy. It became even tougher when I penciled my requirements and considerations, had to look out for a school that offers the most concrete accounting courses, has a good rating from previous students, doesn’t cost my parents their entire life’s worth of savings and the environment it offers to its students and my list can go on and on and on. I also wanted to be close to London, but not in London. Maybe I was being too specific or too picky but I remember spending hours and hours reading the reviews about the various universities, their blogs, rankings and looking for graduates that are happy and those that weren’t. 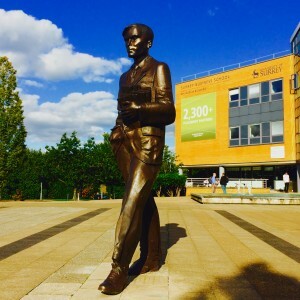 During my hunt I came across University of Surrey, it blended everything in for me quite well. After all my research and while applying for my program, I had a feeling that this would be the right match – the place where I want to be for a good twelve months. And London’s just 30 minutes away! You can see my Surrey Business School in the background! I can’t express the feelings I had the day I received my offer letter from the University in this blog. I just couldn’t wait to travel 7000 km and start school again (no it wasn’t just for accounting). Once that was settled, another important decision for me was to decide on my accommodation and my preference was to not live inside the campus. Manor Park was my decision and it’s a really good place to live in. Everything’s so close from here, even by walk. University is just 18 minutes and our favorite Tesco is just a lazy ten minute walk away. Oh and my favorite place, the Surrey Sports Park is literally about five minutes from Manor Park! This is the best time to be in this University. It was awarded University of the Year recently and being a student, I really can’t ask for anything else. Simply put, I feel I am living my life well, making new friends and enjoying my time in a great university! I’ve been here for about two months, and am looking forward to the next year which should be great fun and very exciting. I will keep you all posted on my adventures here – please keep an eye out for my blogs. Winter, rain and a changed me!